Have you heard about Cryptocurrency or Blockchain Technology, but you are still vague about what they are and how they work? Blockchain Technology is the most significant innovation since the internet and it is about to take the world by storm. Blockchains will completely change the way that our Governments, Financial Institutions, and Health and Business Systems across the globe process transactions and exchange information. This revolutionary new technology is a multi-purpose tool which can be used in countless applications and will soon impact upon every single one of us from all walks of life. 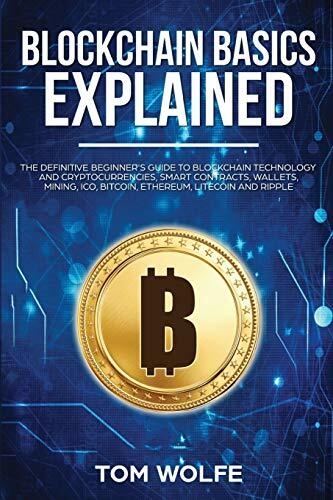 Blockchain Basics Explained provides concise information on all aspects of Blockchains, Wallets, Mining, Smart Contracts and ICO's. In addition, this book will provide practical guidance and instruction on working with blockchains and how to buy, store and invest in cryptocurrencies including Bitcoin, Ethereum, Litecoin and Ripple. You will also discover how to spot and avoid scams. Unlike other books on these subjects, no fancy formulas or technical jargon is used, and no previous experience of any of the topics is required. Are Cryptocurrencies a sound investment? What is a Block and how is it made? How do Blockchain components interact? What started the Blockchain Revolution? Why are current Financial Services disrupted? Could Blockchain Technology replace our institutions altogether? What are the main Blockchain pros and cons? What is the truth behind Blockchain myths? What are the Blockchain main application scenarios? What is the Bitcoin story? What is Litecoin and how can it be used? What are the alternative Blockchains? Smart Contracts explained. What are they and are they legally binding? How does mining work and is it necessary? Where does Ripple come into this? What are Wallets and what function do they have? How can you Invest and make money with Cryptocurrency and Blockchain right now? How to spot and avoid scams. What are the main Blockchain Technology terms? What are the benefits of the de-centralised Blockchain Technology? Don't get left behind. Scroll to the top and pick up your copy of Blockchain Basics Explained today and get the ebook FREE with the paperback! You Don't need a Kindle to read this eBook. You can easily download it and read on your PC, Mac, Smart Phone, Tablet, iPad or Kindle device.